Lustalux Ltd was established in 1991 and since then has developed a range of complementary and technical window treatments designed to provide solutions to many varied situations. We are able to offer an effective service anywhere in the UK and work closely with many major companies, hospitals, colleges and universities in providing comfort safety and security. Glass is often less strong than people imagine. It is a fragile material which, if not toughened or reinforced, can pose a potentially extremely dangerous hazard. In these times of "claim culture" not only is it vital that you protect people from possible injury, it is also important that you avoid the threat of legal action that could result from a glass-related accident. Furthermore, compliance with current legislation can prove very costly if you choose to replace glass: Lustalux glass film can provide you with the ideal alternative. We can offer you protection and peace of mind wherever glazing may be a Health and Safety risk in your workplace or home. 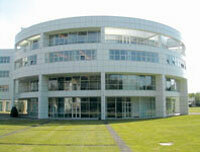 commercial applications for everything from office blocks to manufacturing plants. Ensure that your business experiences minimal disruption should an incident occur. We can also protect your glass against spontaneous shattering which can occur when toughened glass becomes contaminated. multi-laminate protection for buildings or areas (corporate, Public Sector and Government) deemed to be under particular risk from bomb-blast. Our specially designed films provide invisible protection and, in the case of an explosion, can prove a real life-saver. Our safety films are available in clear, reflective, tinted and smoked versions and all films are tested to the required BS and prEN standards. We also stock a wide range of versatile "combination" films which provide the multi-functionality of safety protection, solar control and privacy control. Click here for further technical details or call us on 01772 72 66 22 if you have any questions or require a same day quote. When it comes to break-ins and vandalism, windows are THE most vulnerable area of a commercial or residential building. Thieves see windows as an easy access point, particularly at business premises, and the effects on companies as a result of theft can be devastating. With theft on the increase and insurance premiums continuing to soar, can you afford not to protect your personal or business assets? Security or "anti bandit" film acts as an invisible barrier to combat the threat of break-ins. Less of a preventative solution and more a deterrent, our security films substantially increase the time and effort required to force entry, and avoid the need for unsightly bars, boards or shutters. Security films by Lustalux are available in clear, reflective and tinted versions and all films are tested to the required BS and prEN standards. We also stock a wide range of versatile "combination" films which provide the multi-functionality of security protection, solar control and privacy control. At Lustalux we have taken security film to the next level with the introduction of a range of anchoring systems which bond our security film, the glazing and the frame into one secure unit, thus eliminating any potential weak points and offering your premises maximum protection. Call us on 01772 72 66 22 if you have any questions regarding security film or require a same day quote. Most of us would agree that a light, bright workplace makes for a good working environment. The same applies in the home, particularly in conservatories. Throughout the year the solar effects of glare and temperature increases can have a massive effect on us. At work especially, soaring indoor temperatures can cause a huge reduction in productivity as well as stress, tiredness and even illness. Window glare can cause the use of computer screens to become almost impossible, make production line work difficult or even dangerous, and potentially cause hygiene problems in areas of food preparation. At 68 degrees Fahrenheit, work productivity is optimised. At 75 degrees, productivity drops by 40%. UK legislation states that business premises must maintain a reasonable temperature in the working environment. Installing solar control films will not only keep your company on the right side of the law, but will reduce the load on air conditioning systems, thus reducing your operating costs and energy tax liability as well as "greenhouse gas" emissions. In addition, solar control film will reduce the fading effects and potentially harmful consequences of UV rays. At Lustalux we offer business and residential clients the most comprehensive range of solar control films in the UK and our range of options can reflect heat and light energy by as much as 78%. All of our films are tested to the required BS and prEN standards. We also stock a wide range of versatile "combination" films which provide the multi-functionality of solar control, privacy control and safety/security. 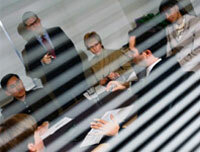 Privacy and confidentiality are a must in many day-to-day situations, both in the home and at work. Security screening for financial offices, boardrooms and other sensitive areas (such as bathrooms or changing rooms), both internally and externally, is a must for many companies. Privacy film can also act as an anti-theft deterrent: Lustalux films make it is possible to obscure the view through windows from prying eyes whilst maintaining sufficient light transmission into your building. Our privacy films are available in two types: obscuring films (with a "sand blast" or "frosted" effect appearance) which prevent clear vision from either side of the glass, and "mirrored" or "smoked" films which restrict inward vision only during day daylight hours. These films are suitable for the office and home alike and are available in a range of colours and designs. Also, our sister company, Quali-tint offers a high specification automotive window film for vehicles. All films are also tested to the required BS and prEN standards. 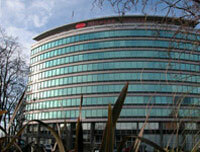 Always at the forefront of industry innovation, Lustalux is pleased to supply Lumisty film. Lumisty is a film with a difference: it not only provides privacy it also presents a whole new range of stunning possibilities for window graphics and design. The appearance of this special film changes from transparent to translucent depending on the angle from which it is viewed and the translucent area can be determined by either vertical or horizontal direction. For further technical details call us on 01772 72 66 22 if you have any questions or require a same day quote. At Lustalux we have many years experience in the supply and installation of blinds and curtains in commercial and Public Sector buildings. We offer our clients a quality range of vertical, roller and Venetian blinds and curtains in a range of design styles, suitable for everything from a typical office to a hospital or university. Far from being an alternative to window film, blinds and curtains can provide additional protection against year-round solar glare and fading as well as offering added privacy and solar heat rejection. When installed in conjunction with window film, blinds and curtains work perfectly as a stylish addition to the workplace. 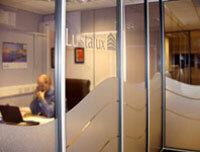 Lustalux really can offer a "single source" solution to retrospective window treatment and enhancement. Call us on 01772 72 66 22 if you have any questions or require a same day quote. 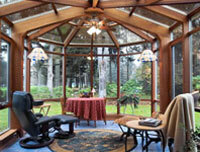 Conservatories are the biggest source of retained heat in the home. The heat build-up in a conservatory can be massive: given that these are usually an additional room in your home for relaxation, feeling hot and uncomfortable will certainly defeat the object. Blinds provide some shade but they gather dust and dirt and because of the sheer amount of glass and/or polycarbonate in a conservatory solar rays will still be able enter, get trapped and quickly increase the interior temperature to sometimes unbearable levels. Lustalux has the answer: CoolKote, an ultra high performance metallised PVC coating, specially designed for the polycarbonate or glass roofs found on most domestic conservatories. Up to 80% of solar rays, and therefore heat, are reflected away, thus massively reducing glare and heat build-up as well as providing an essential UV-ray barrier. Make your relaxation room as comfortable as possible, all year round: call Lustalux on 01772 72 66 22 for further information or for a same day quote. Window films are not only a means to make your working or home life more comfortable or enjoyable: they can also attract attention, provoke reaction and make a statement, for either business or pleasure. The clear identification of transparent glass is a legal requirement wherever there is risk of human impact. On May 1st 2004 a new regulation Document M - Access to and Use of Buildings (2004 edition) was issued. This refers to new critical location buildings, and refurbishments of existing buildings from that date. This identification need not be boring or spoil the appearance of a glazed area: with the help of Lustalux you can transform this necessity into a highly impactive visual display. .and this doesn't just apply to windows. Doors, patio doors, partitions and modesty panels can all be transformed with anything from simple, elegant lines to elaborate designs, with a mixture of clear and frosted detailing and a multitude of colours. We work very closely with our clients through the design stage to final installation to ensure that the desired effect is achieved. We can quite literally create a work of art for you, at home or at work. 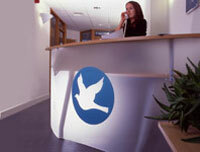 Why not call us on 01772 72 66 22 to find out more about the vast array of design possibilities available to you. Here you will find a whole host of easy-to-fit window graphics from the simple and functional to the downright whacky, and this range can also offer practical solutions to the issues of solar control, safety and privacy. A superb range of designs and colours, a user friendly online shop and an easy-to-fit product: contemporary glass design made simple, by Lustalux.